It’s Pizza Week and my favorite group of bloggers has come together to give you yet another week filled with delicious recipes. 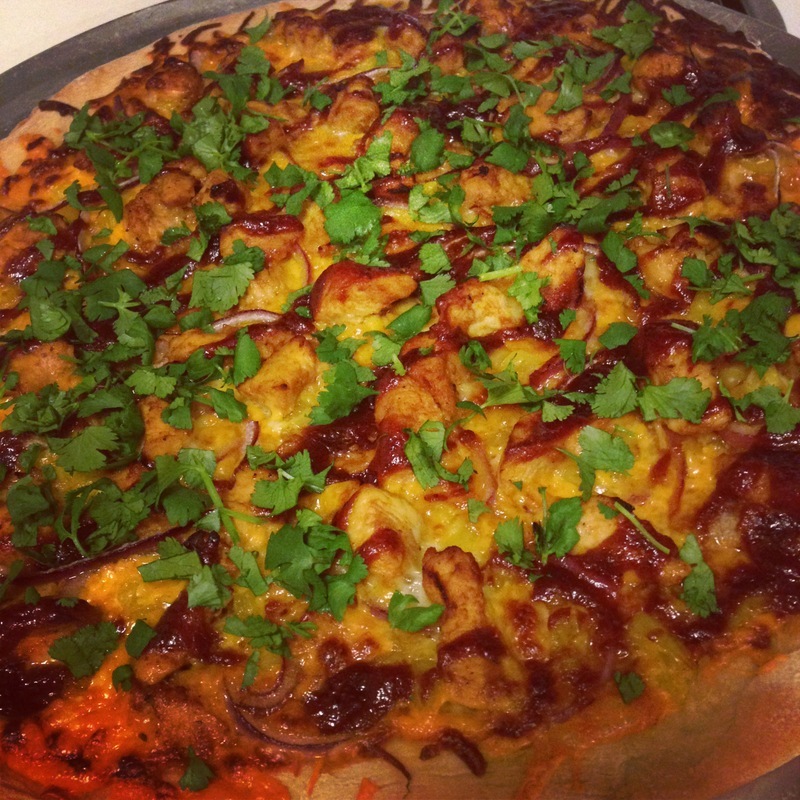 I made Tangy BBQ Chicken Pizza! Pizza Week (aka my favorite themed week thus far) could not have come at a more inopportune time. I’m still on my elimination diet and cheese is still off-limits. However, I’ve made this pizza enough times to know it is superb, and my handsome taste-tester agrees with me. It’s based on one of my favorite pizzas of all time, The Wrangler, from Pizza Luce. 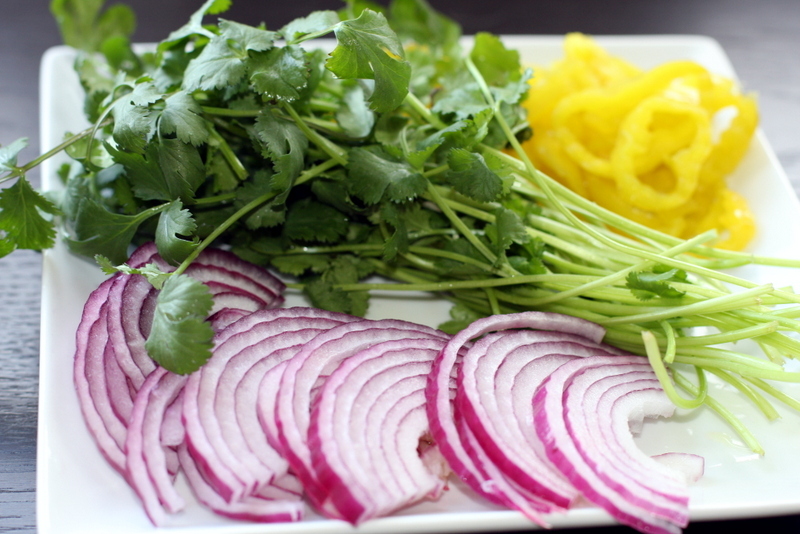 The tangy BBQ sauce plays nicely with the crunch of red onion and the zip of banana peppers. This pizza has a lot of bold flavors that give it a POW! ZAP! BANG! Chop the chicken into bite-sized pieces and liberally salt and pepper the bits. 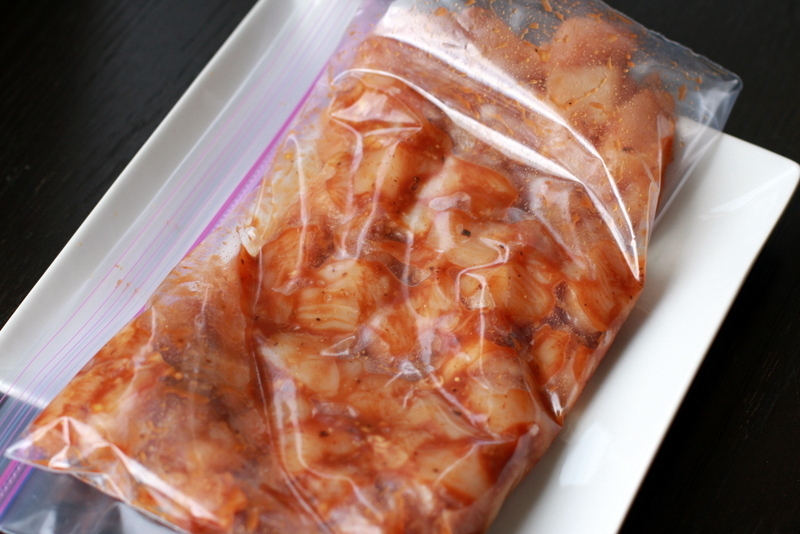 Toss with BBQ sauce and garlic in a ziplock bag. Marinate the chicken in the fridge for at least 30 minutes. While the chicken is marinating, you can prep all of the other ingredients. I almost always use block cheeses when cooking because the pre-shredded cheese has added chemicals to keep it fresh, which funks up the taste and also causes problems when you want to melt it. Put a skillet on medium heat with 2 tsp. olive oil. Once the oil is just shimmering, add the chicken and cook until heated through (approx. 6 minutes). Remove the chicken from heat and set aside. 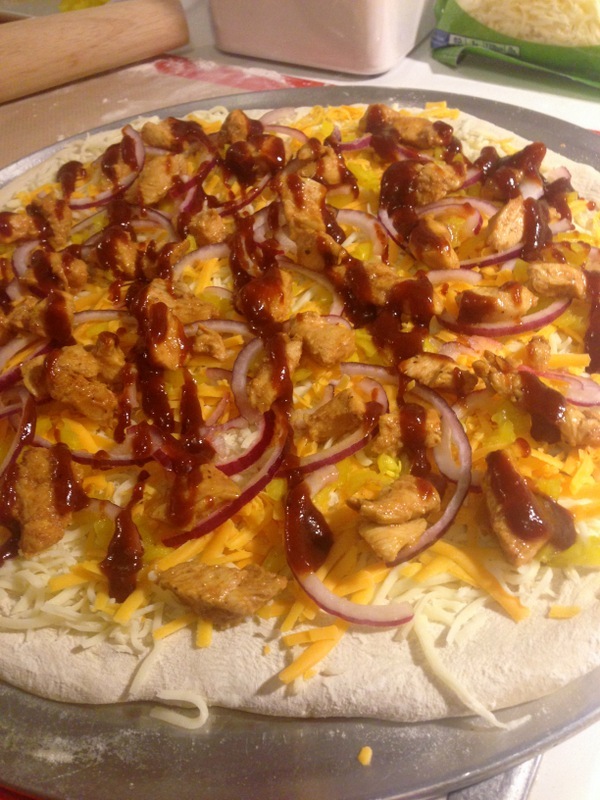 Roll out the pizza dough, top with onions, banana peppers, chicken, cheese, and a drizzle of BBQ sauce. Pop in the oven and bake according to the pizza crust package. Once you pull it out of the oven, top with freshly chopped cilantro and enjoy! 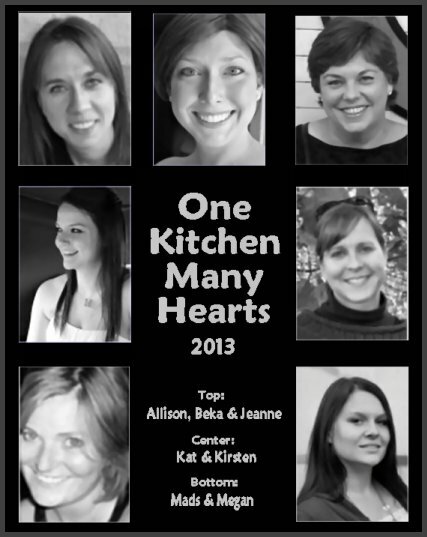 Top Row: Allison , Beka & Jeanne, Center: Kat & Kirsten, Bottom Row: Mads & Megan. To polish off 2013, my lovely blogger friends decided to send Christmas packages to each other. I love our tradition of sending goodies in the mail so much, especially because it feels like we’re not so far away. This holiday season, Allison sent me a big box of goodies. I was waiting all year for a box from her because she has been whipping up homemade marshmallows and I’m officially the last person to taste her wonderful mallows! 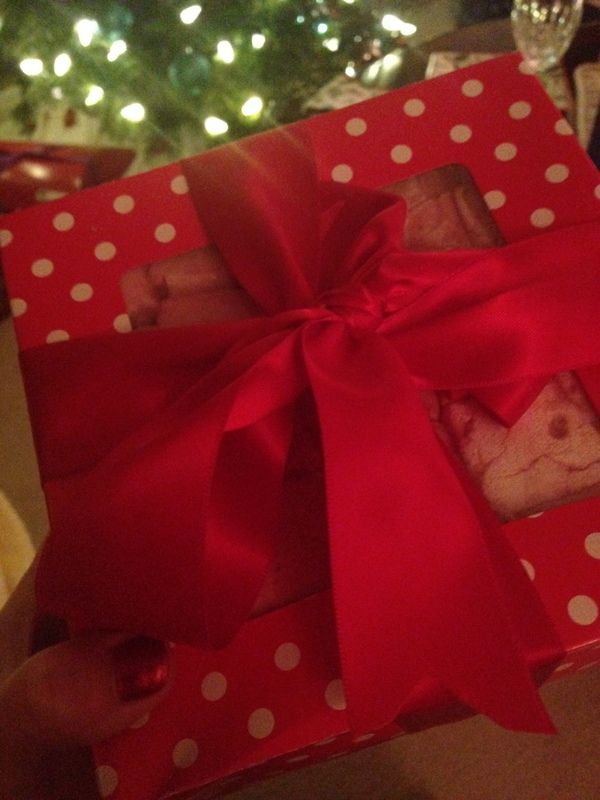 They did not disappoint…perfect cranberry marshmallows that are gooey, fluffy, sweet, and tart perfection. The only snap before the mallows were demolished. 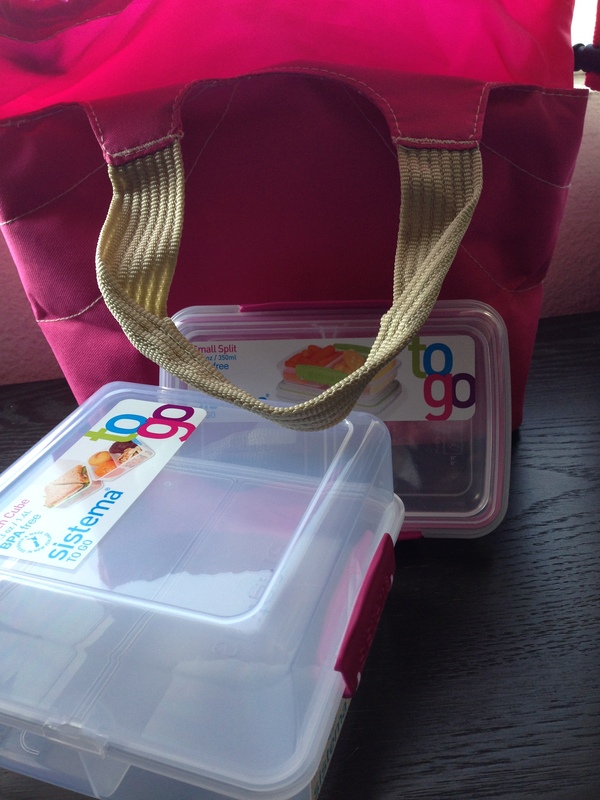 Allison must know I spend most of my days running to and from various jobs without a lot of meal time because she got me an insulated lunch box with cute Tupperware for meals on the go! Little does she know, she’ll be joining the club soon when she starts her graduate program this year! To fill the lunch box, she also included Happy Hippo hazelnut biscuits (Yum) and chocolate kale. I’m sorry friends, the chocolate kale horrifies me. I still haven’t tried it, but I’m hoping to conquer my fears in 2014. She also included a bottle opener, no doubt to fuel my beer-drinking habits. 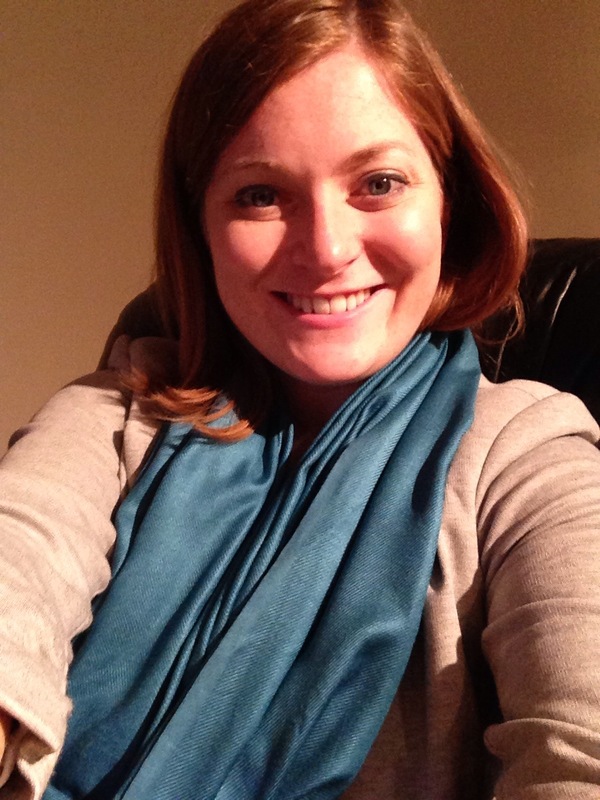 If that wasn’t enough, she also sent me a gorgeous turquoise scarf! It’s beautiful! I love it so hard. I have a severe scarf obsession and wore it almost the entire time I was in Minnesota for the holidays. I can’t wait for more cold weather to wear it again. Beauty! Thanks so much for the thoughtful gifts, Allison. If you haven’t read her blog yet, you should. She writes about adventures in running, parenting a 5 year old who loves glitter, whipping up fabulous meals for her family, and so much more. Check out what I sent Kirsten here! What was your favorite gift this holiday season? *please excuse the pictures in this post. I decided to make this cake at night after a few glasses of wine. It’s time for another rendition of theme weeks and this week is brought to you by pumpkin! (insert pumpkin foofaraw here) Truth be told, it’s still 80 degrees in SoCal right now, so my mind is not registering “Pumpkin Week” quite yet. However, in the spirit of team camaradarie, I decided to join the party with a pumpkin spice cake. 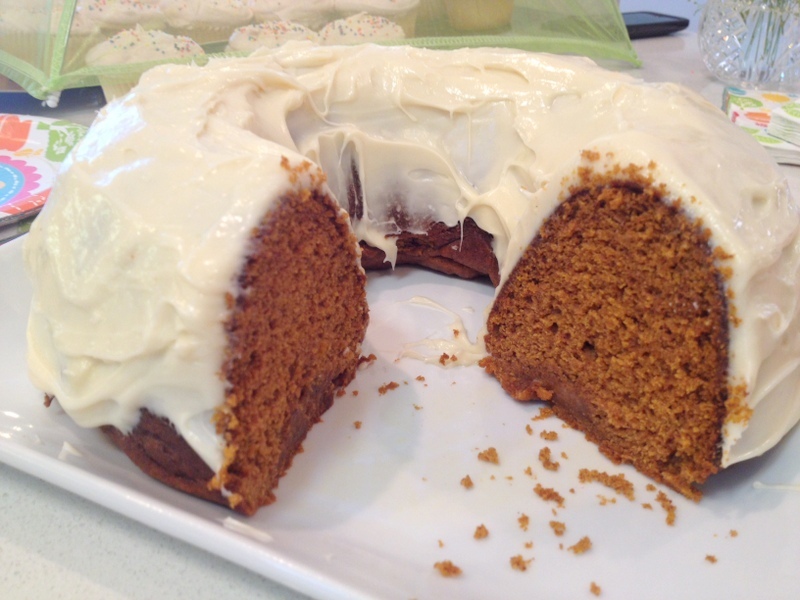 I know you’re probably thinking, “Pumpkin spice cake? Yawn.” But let me tell you, this cake is a delicate balance of pumpkin, spices, and sweetness that you will want to add to your repertoire of “classic” recipes. 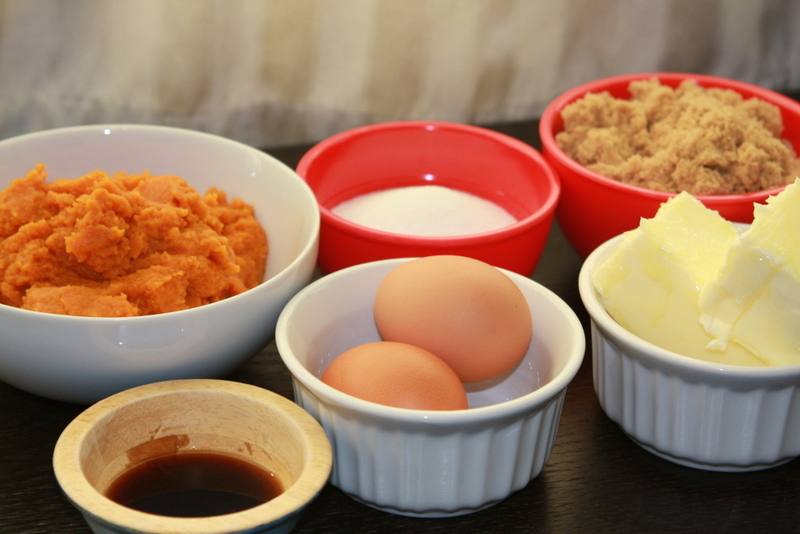 Now, in researching pumpkin spice cake, I found there were not many variations in recipes. Some called for buttermilk or sour cream to moisten things up, but I felt like the pumpkin would create enough moisture on its own. Other recipes went crazy on spices, but I wanted to let the pumpkin shine through. This cake turned out perfect! 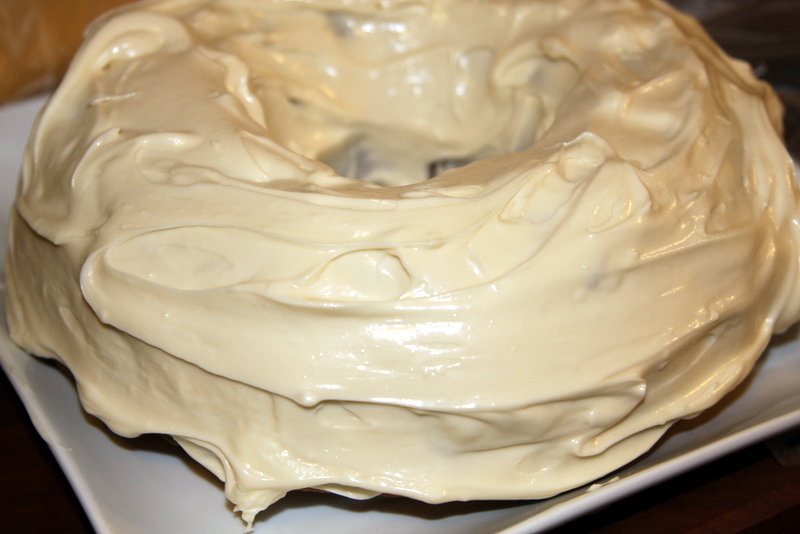 The cake was full of flavor and the sweetness of the maple frosting balanced with the spiciness of the cake. I am definitely making this again for Thanksgiving. 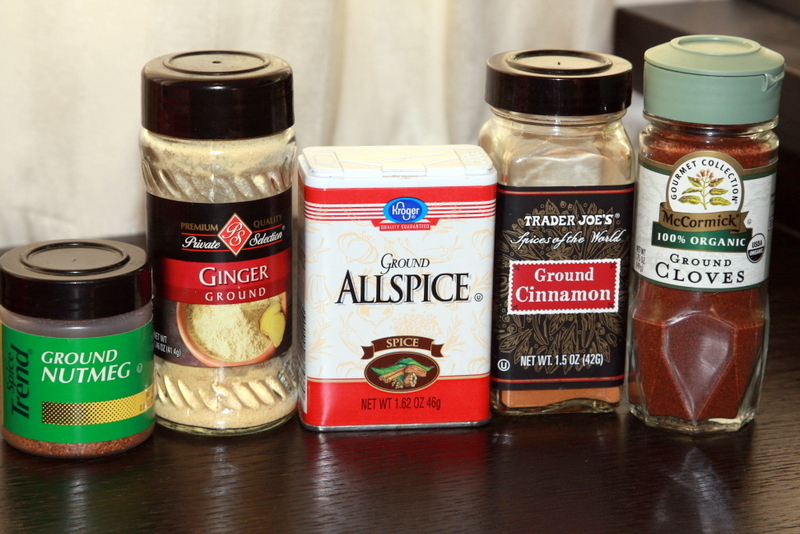 Mix the dry ingredients together in a bowl and set aside (flour, baking soda, salt, spices). The finest of supermarket spices. 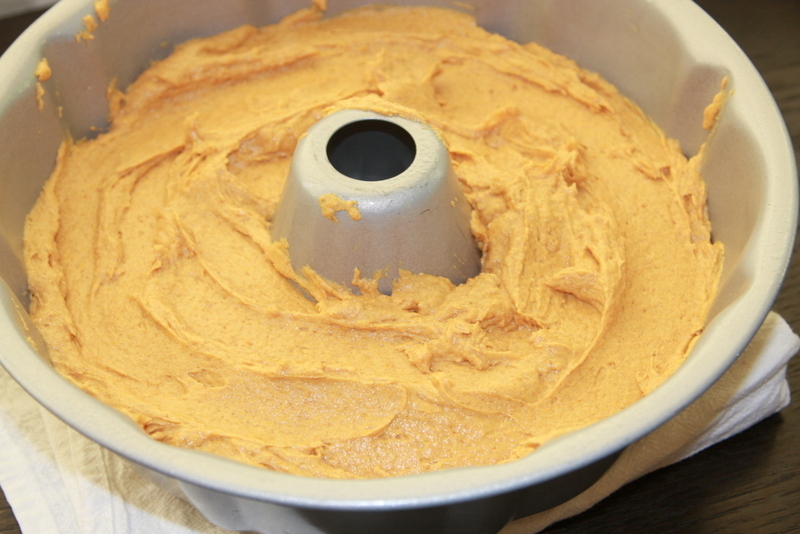 Using a mixer, beat together butter and sugars until combined. Add eggs one at a time and vanilla. Beat until creamy. Then add the canned pumpkin until just combined. Slowly add the dry ingredients to the pumpkin mixture until the dry ingredients are fully incorporated. Pour batter into greased bundt pan (or use my pal, Comfortably Domestic’s handy baking pan conversion chart). Bake for approximately 25-30 minutes (check with a toothpick). Wait until the cake has cooled completely. Beat butter, cream cheese, vanilla, and syrup together until creamy. Add powdered sugar one cup at a time until it is as sweet as you would like. I think I stopped at 3.5 cups, but I was eye-balling it. I should stop doing that when I’m developing a recipe, but whatever. Spread the frosting over the entire cake until it’s as perfect or messy as you like. Mine was rather messy, as you can see. Please check out the other wonderful recipes for Pumpkin Week! As you might have already guessed, my favorite group of bloggers has teamed up again to bring you Berry Week! I love doing these theme weeks because it spurs on my creativity in using ingredients for something new. 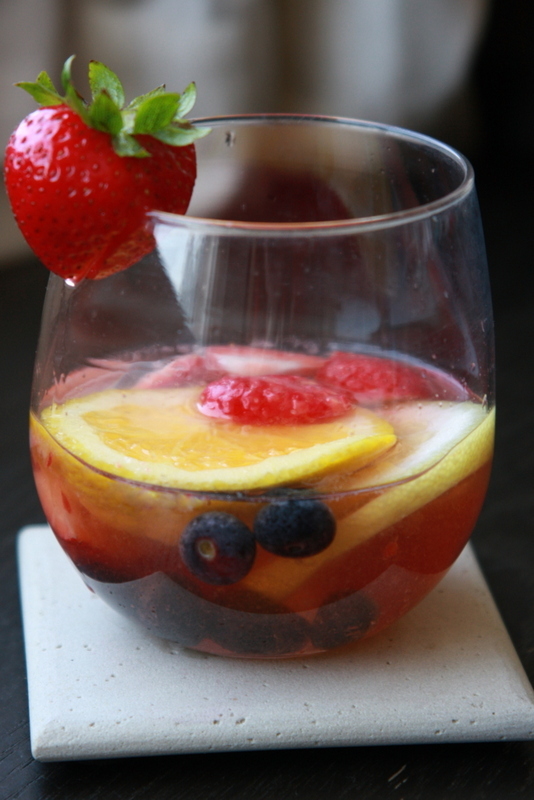 This week I decided to make berry sangria! I’ve posted several berry recipes in the past, but this “recipe” is one of the easiest and by far the booziest. I put recipe in quotes because it’s mostly dumping ingredients into a pitcher. Ain’t nobody got time for a more complicated cocktail recipe. The most complicated recipe we used in college was “D the B”, in other words, drink the booze. I had the best time acting as a mixologist for berry sangria because each variation needed its own glass taste test. *hiccup* In the extensive taste testing, I discovered Triple Sec is the secret ingredient and cannot be omitted. Also, there are many different schools of thought on sangria, but my own personal beliefs are that wine should never be diluted with soda. Ever. Amen. Thoroughly wash all berries. Slice orange and lemon into rings. In a large pitcher (or a small pitcher + awkward Tupperware container like me) stir together wine, Triple Sec, and sugar until the sugar is completely dissolved. 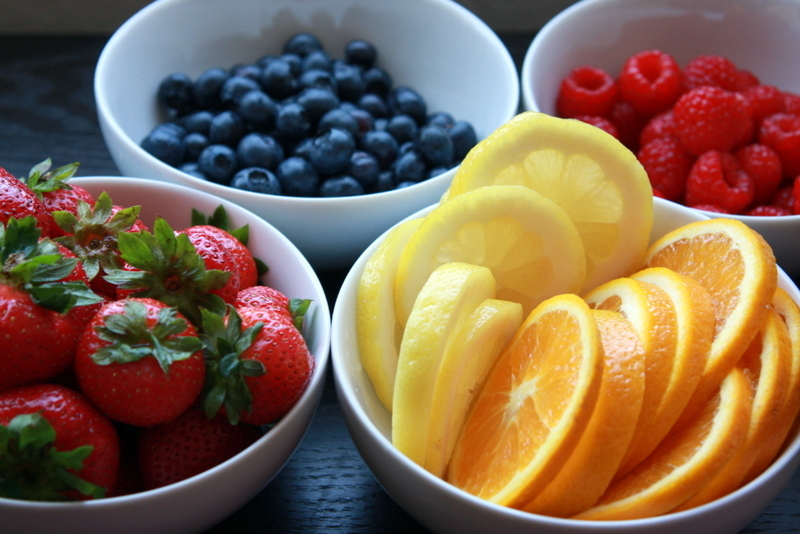 Toss in the fruit and refrigerate for at least an hour before serving. The long chill time allows all of the booze to soak into the berries. The great thing about this recipe is that you can easily halve it if your party is small. The OTHER great thing about this recipe is that it tastes delicious. The other OTHER great thing about this recipe is that you get to eat a ton of booze berries at the bottom of your glass. What’s your favorite use of summer berries? This month’s One Kitchen Many Hearts box was “picnic” themed to get us all amped up for the long days of summer. Is it just me or are this year’s “long days of summer” turning into the fastest most non-existent days of summer ever? It’s already July! I had big plans to spend most weeknights this summer lounging with a book on the balcony and most weekends lounging by the beach. Unfortunately, I have been working 50 hour weeks and the weekends have been so packed with activities that I can’t even think straight. Don’t get me wrong, I love doing things on the weekend, but this summer isn’t exactly the lounge-fest I envisioned. 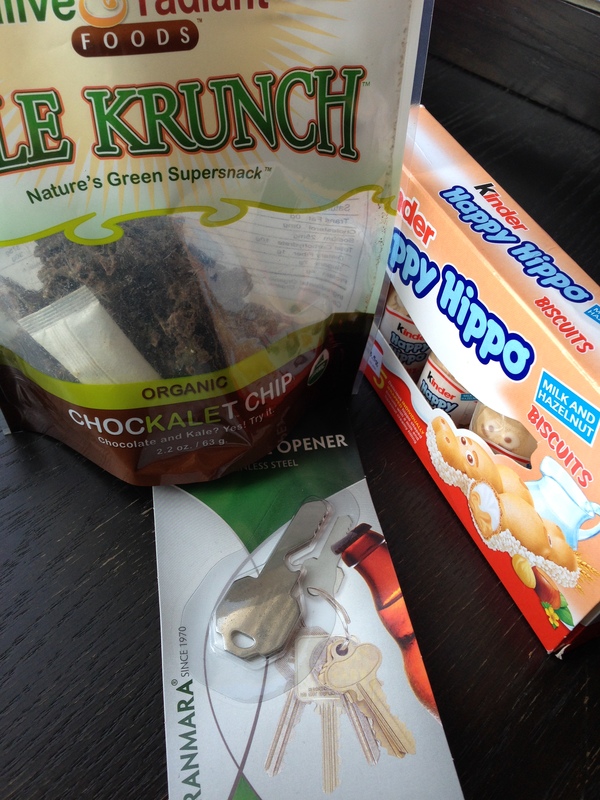 I know that the goodies Kat sent me in the OKMH package will help simmer me down after a long work week. She knew just what I needed to slow myself down and enjoy each moment summer has to offer. 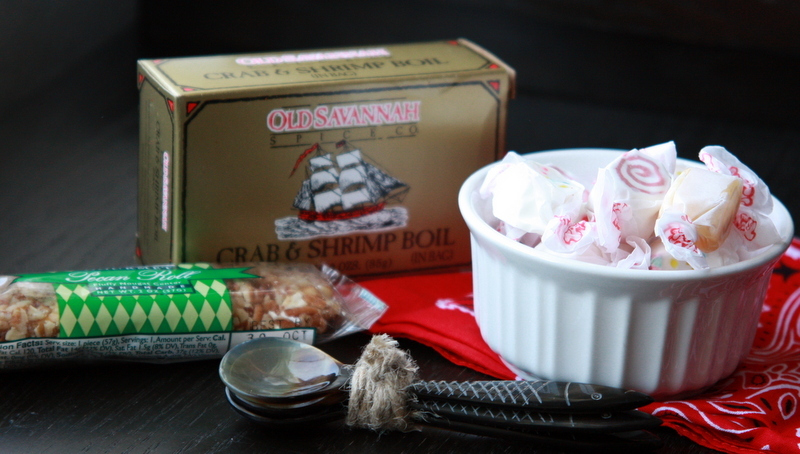 Kat sent me a lovely box filled with some goodies from her recent trip to the South. Adorable little spoons…for caviar? Coffee stirrers? They’re so cute, I will probably use them for everything. Red velvet, frosted cupcake, and salted caramel swirl taffy! I’m not sure I’ve ever had taffy before, but I can honestly say this stuff is addicting. Unfortunately, the taffy came in an unmarked white paper bag, so I’ll have to hunt her down for the source. Fingers crossed it was from a chain that exists in California. Hrm? Where was I? Oh, something about how excited I am to attempt a crab boil at home with this kit! Thanks for the love, Kat! Has summer been flying by for you too? What are you most looking forward to this summer? Today is…drumroll please…BAKE SALE DAY!!!! Click image to open a new window for the bake sale! As you have already heard, I’m raising money in a Bake Sale via the internet for Crohn’s and Colitis Foundation of America. You can bop over to Megan’s blog to see all of the wonderful and delicious prizes from cookies to brownies to signed cookbooks by some of your favorite bloggers! 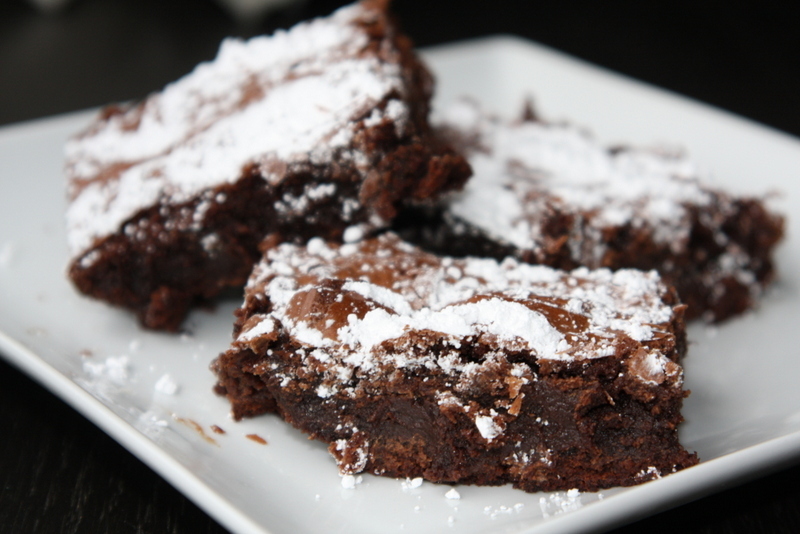 I made these perfect fudge brownies and a big ole box of them could be yours! It’s easy to win. Megan explains it all on her site. Go there now. Start the bidding! Welcome to CARAMEL WEEK!!! This week marks a momentous occasion when strong and courageous women bloggers stand up for what is good and holy in the world–caramel. I honestly could not be more excited for all of the delicious recipes from caramel week! To think of all of the caramel taste testing that went on during recipe development is mind-boggling. There was a lot of spoon-dipping and finger-licking in my kitchen alone! It took me a surprisingly long time to decide on what to make, mainly because caramel anything is amazing. A local restaurant serves an incredible bananas foster bread pudding, so I thought a riff on that might be fun to try. Boy, am I glad I did! 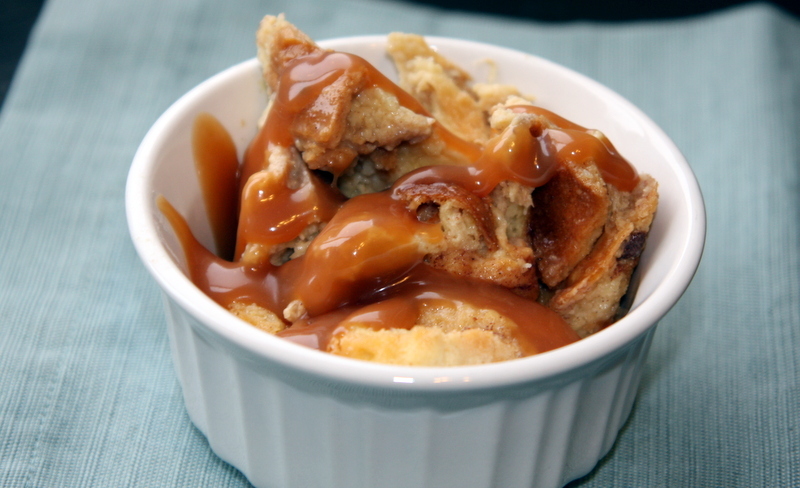 This caramel banana bread pudding is The Taste. I always start my recipe development by scouring the internet and cookbooks for recipes similar to what I’m planning on making. I usually check Foodgawker.com, FoodNetwork.com, America’s Test Kitchen, Mark Bittman’s How to Cook Everything, and whatever other books I have lying around. Once I’ve found a few favorites, I examine the ingredients in each, decide upon what I think would taste the best, and what my ratios should look like. I really liked the idea of challah bread because it is thick and eggy, which fits perfectly with an eggy bread pudding. I decided to use more brown sugar in my recipe because bananas and brown sugar are like bread and butter, like Sonny and Cher, like a shmoke and a pancake. I also knew that I would need to replace some milk with heavy whipping cream because…well…heavy whipping cream makes everything better. Obviously. After I decide upon my ingredient list, I make up ratios needed to increase the flavor town (pinch of salt here, extra vanilla here, etc.). 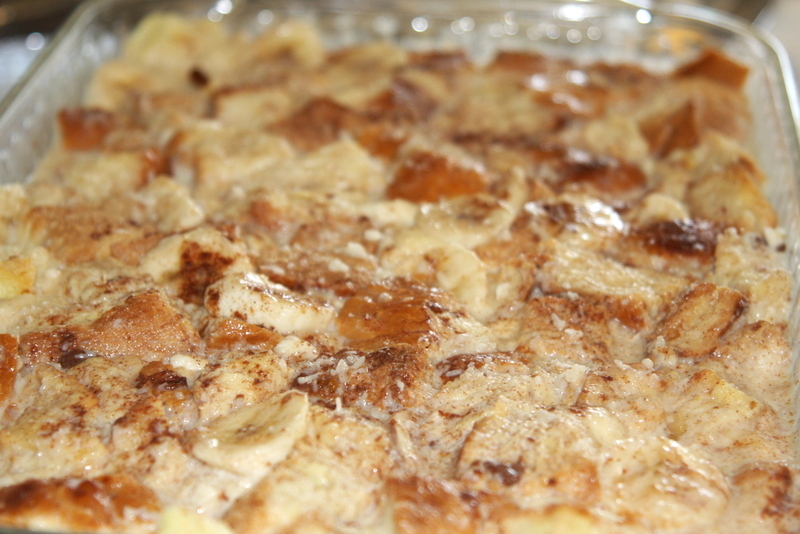 Eventually my bread pudding recipe was ready to go and I was ready to start cooking! Slice your challah into 1 inch cubes like this. I ran into a problem when I was pouring the milk and egg mixture over my challah; I didn’t have enough liquid to cover the bread! Nothing to fear, I simply added a splash more cream and wrote down a new estimated amount on the recipe. This is what your pudding should look like after soaking and smooshing for an hour in the fridge. If my recipe is a winner, I post it on the blog. If it’s terrible or mediocre, it’s back to the drawing board! Recipe development sounds scary, but it’s really fun to get creative with your favorite ingredients and to try out new foods. 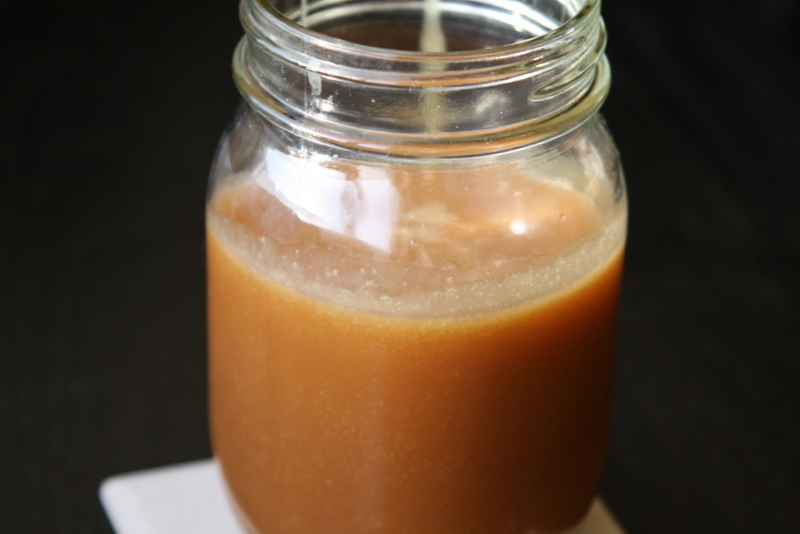 For ingredients and directions for the salted caramel sauce, visit Comfortably Domestic’s blog. Her sauce is wonderful. It tastes almost like a Werther’s Original, but so much better! Leave the challah out on a cookie sheet overnight to dry. You can also dry the bread out in the oven at 325 for 10 minutes. Place the challah in a 9 x 13 pan. Do not use a glass pan for this! The pan will go straight from the fridge to the oven and we don’t want any broken glass pudding mixtures in the bottom of our oven. Mix all other ingredients in a large bowl until combined. Put the bread pudding in the fridge for 1 hour. 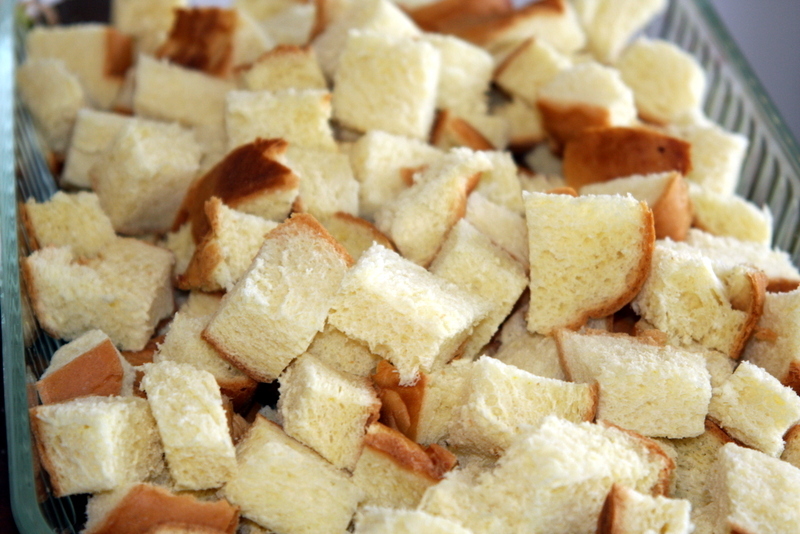 Squish the bread down into the milk every 20 minutes so that each cube of bread is soaking. This allows the bread to absorb all of that nummy milk mixture and to ensure you aren’t inadvertently making croutons. Bake for 45 minutes or until pudding is no longer jiggly. Serve and drizzle Kirsten’s salted caramel over the top. Have you ever created your own unique recipe? How do you develop recipes?